Free Download PowerISO and How to mount the ISO file - PowerISO is one of the software you must install on your pc or laptop, if you are a gamer who often download game applications on the internet. What is the PowerISO Function? of course the most important is to mount games that are ISO format. Actually Tutorial How to Use PowerISO I've discussed in other blogs, but to be more clear again and software support this game you can use forever for free, so I update again with Patch that is practical to use. 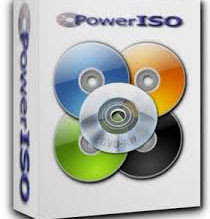 In addition to Mount ISO requirements, PowerISO can also be utilized to Create ISO Files. Uninstall the old version if any. Turn off Antivirus so that the process smoothly. Install 32-bit / 64-bit PowerISO, adjust to your OS. To find out, click Start or Windows logo, then right click on Computer and select Properties. Please refer to System type. Click I Agree and Skip. Select custom installation and uncheck Install Baidu PC Faster - Next. Repeat number 5, uncheck Install TuneUp Utilities 2014 or I do not accept - Next. Specify File Associations. For example I checked iso, daa, bin, cue, nrg, img, mdf, uif and isz. Or Select All is also allowed, then Close. Run Patch setup, then click Patch and Exit button. Do not forget to restart Antivirus. Right-click on the ISO file, then point the mouse cursor at PowerISO. In Set number of drives select 1, or 2 if the ISO file is divided into 2 parts / CD. Repeat step number 1, then click Mount Image to Drive <No media>. Right-click on the virtual drive you have previously set, then select Open. Run setup.exe or other files that work to install the game.